The 10 Best Taco Places in Mississippi! Tacos might be the perfect food. They're portable, versatile, usually very affordable, and always delicious. From street style to traditional, these are the 10 best places to get tacos in Mississippi. All Green Ghost Tacos' items are made fresh when you order, and they offer a variety of options so you can perfectly customize your meal. The choices range from traditional (ground beef and chicken) to the bold—only the most daring will try the Lengua, or beef tongue tacos! Like any good tacos in a college town, The Taco Shop's tacos are inexpensive and tasty. The Taco Shop prides itself on making great food in a simple, no-frills atmosphere. 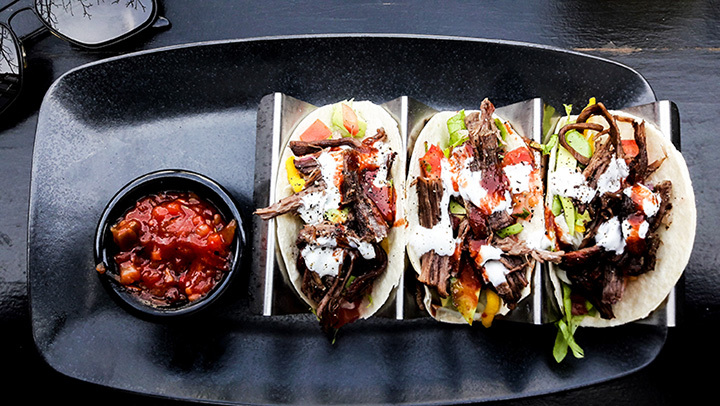 From authentic carnitas to Korean barbeque steak tacos, you'll want to try everything on the menu at this Oxford restaurant. With a tagline like “Fast N Fresh,” you have to know Jaco's Tacos has great tacos. Jaco's doesn't take itself too seriously. They offer a versatile arrangement of fillings, so you're sure to find something you'll love. Be sure to look for their secret menu! Taco Sombrero in Gulfport has been quietly serving delicious Mexican food since 1979. This family-owned restaurant makes all its food fresh every day, then serves it in a casual fast-food setting. They recently expanded to a second location in Biloxi, giving locals even more of an excuse to indulge! Square Tacos is a newer location in Batesville, and they're quickly gaining a reputation for being fast, friendly, and tasty. In addition to tacos, customers rave about the cheesy chicken (or steak) fries. And you know if you're in the Delta, you're going to want to try some delicious authentic tamales! Babalu Tapas & Tacos has been growing in popularity, but this location in Jackson is the original. Relax and enjoy the atmosphere (and a cocktail!) as you browse the taco selection, which includes options featuring pork belly, oysters, duck, and much more. Try the spicy Mexican fudge for dessert! The Jalapeño Grill in Gulfport is a cozy, brightly-colored setting to enjoy delicious authentic Mexican food. They offer daily specials, including Taco Tuesdays, when all tacos are $1. They offer a variety of options for the price, and popular opinion is that the fried, shredded beef tacos are one of the best dollar deals you'll ever find. Atzimba Mexican Restaurant is just what you think of when you picture a Mexican restaurant, and locals in the Clarksdale area know this is a great place to go with family and friends. Enjoy traditional Mexican fare, tacos, and a few dishes created especially by the chefs! El Nopal is brightly-decorated and intimate, with a friendly staff and management and incredible food. Try the daily special or visit on Taco Wednesday for $1 tacos. El Nopal's tacos are a great example of simple food executed perfectly with fresh, quality ingredients, and a great atmosphere. V Taco is one of the most fun destinations in the city of Corinth in North Mississippi, with its rooftop deck and margarita bar. Customers love the friendly staff, laid-back atmosphere, and big portions. Try the Bang Bang shrimp taco or Asian pork taco for on-trend flavors you'll love!